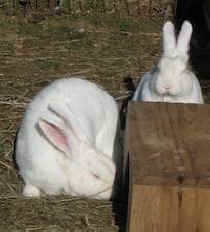 Binky and Bella were part of a group of ten rabbits exploited for an injection skills class at a local college. When an employee of the school who had spent time helping to feed and snuggle the caged lab bunnies learned that all ten would be killed at the end of the class, he decided to take action. Fortunately for these two ladies, Woodstock Farm Animal Sanctuary was contacted to help provide a loving home. We were able to take in Bella and Binky, and the other eight rabbits were relocated to other loving homes! Bella (left) is slightly larger than Binky. These soft, lovely girls can often be seen cuddling together under one of their specially designed bunny boxes. Bella responds to her name, and will eat banana right out of your hand. Binky is a little more shy, but will stick her cute little button nose around the corner and peek out at you. 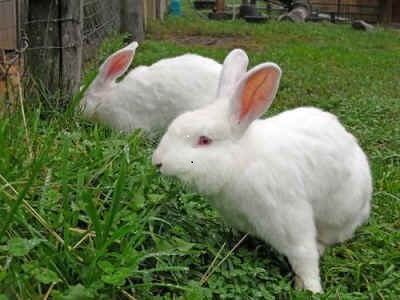 In spite of being poked and prodded with needles repeatedly by college students and kept in a cage in a lab, both of these bunnies are still vibrant and charismatic, and love other critters and humans alike.